This may be a review for some and first time information for others and it may seem like alot of information but if you can bear with the length I think it will be helpful. This is for anyone who has stood at the meat counter wondering what exactly you are buying and how it should be cooked. We will review grading, what exactly is meat and how should each cut be cooked. Each principle builds on the other. There are three grading labels; prime, choice and select. Prime is the highest quality, choice is next and lastly select. Every piece of beef is graded according to its texture, color, age and the marbling. If you do not see one of those words on the package then you are purchasing the select grade and stores generally use their own creative name to define the meat. For example a package may have a seal that says “blue ribbon beef”. The name“blue ribbon” means select. If the meat is prime or choice manufacturers are very proud of that fact and will clearly state that on the label. Because select is a little lower in quality they try and hide that fact behind a nice name. Once in a while they will actually come out with it and say select. We need to remember that meat is actually muscle. If you think of meat in terms of your own body and muscle its easier to understand. When we exercise, our muscles become tough and firm. A steer is no different. The meat from a lazy steer will be a lot more tender than a steer that’s had a lot of excersice and is built like Arnold Schwarzenegger. And along those lines, the meat from a younger animal will be more tender than the older one. That’s because their muscles aren’t fully developed - which explains the principles behind veal. Knowing that meat is muscle helps us understand which parts are tough and which are tender. How should each cut be cooked? The most exercised muscle on a steer is its shoulder. We call that the chuck. The chuck is the toughest part of the animal. The second most exercised part is the rump or what we call the round. Some of the round can be fairly tender, other parts are a little tougher. The muscles that get worked the least are in the rib and loin area. They’re going to be the most tender and also the most expensive. All the best steaks come from there. Before we go on, we need to talk about cooking methods. When we’re talking about meat there are two possible ways of cooking it; we can use dry heat or moist-heat. Dry heat would include cooking under the broiler or roasting in the oven or grilling. Those are methods of dry cooking. Moist cooking methods include the addition of a liquid, just like the name implies. Braising is the culinary term for cooking with moist heat. That’s when you simmer a tougher piece of meat in a liquid for a long time. So how does those related to each part of the animal. Let’s start with the chuck. The chuck tough. It is full of tendons. The only way to break down all that tissue is to simmer the meat for a long time. Or in other words the moist heat method works best on tougher cuts. 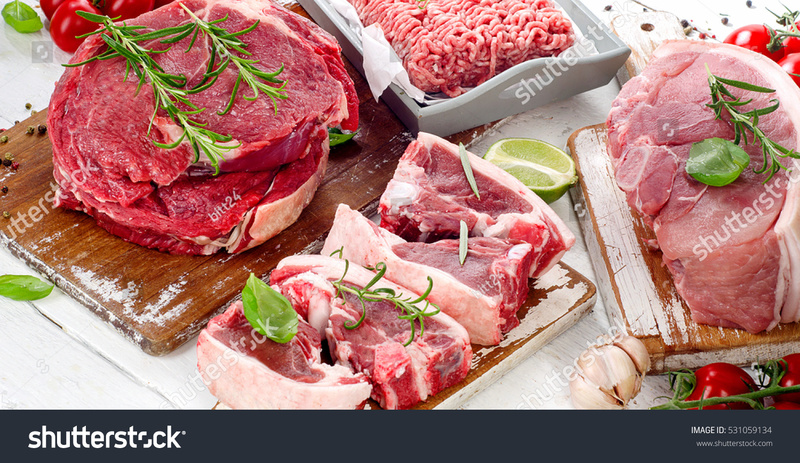 Some other names that indicate a tough piece of meat are the words shoulder, shank and arm. If you see those words in the description all those cuts need to be cooked slowly in liquid. You really have no other choice if you want your meat to be tender. The round or rump is a little harder to figure out. You can always cook the round using moist heat but quite often you’ll get good results with dry. And here’s an good example. Ever noticed the huge beef roasts that are served at buffets? Those roasts come from the round and they’re cooked with dry heat. They’re roasted at a low temperature for a long time. When you’re trying to decide how to cook a piece from the round you should take into consideration the grading of the beef. Is it prime, choice or select? The higher grades of round will broil and grill better than lesser grades. Anything that says rib or loin is meant to be cooked with dry heat. That means you can grill it, broil it or roast it. It is not intended to be simmered in liquid. In fact it tends to get dry and tough if it is simmered too long. Now with all these rules there is an exception, which is flank steak. Flank is a tough muscle yet it’s always cooked with dry heat. Dry heat works with the flank because when it’s served it’s cut crosswise into very thin strips which which we cal mechanical tenderizing. The pieces are cut so thin that it compensates for the toughness and makes it easy to chew. And one final comment about grading. In our society we have grown accustomed to lean meats and many of us are repulsed by the presence of fat. Don’t be shocked when you look at a prime steak compared to a choice and a select grade. The prime is loaded with fat (marbling is term used in the food industry) which represents flavor and tenderness. The select grade will appear much leaner but it also means the meat will be less tender and have less flavor. Everything’s a trade off.